I had really high expectations and you know what? It lived up to them! Writing: Alexandra Christo’s storytelling is magnificently enticing. I was just so captivated by the fast-paced plot and characters that I couldn’t put the book down. The writing is beautiful and fluid, there is attention to every little detail and the characters are very well-developed. I just can’t believe this is her debut novel! 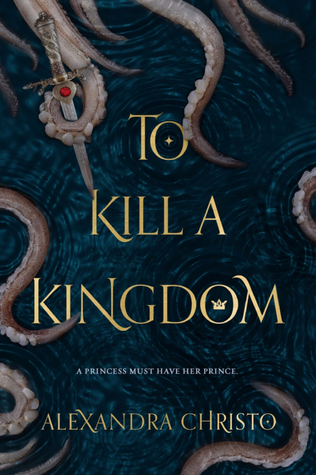 To Kill a Kingdom is brutal and lyrical, and I found myself highlighting so many quotes. Yep, I’m officially in love with Christo’s writing skills. Characters: Lira, the Prince’s Bane, she collects the hearts of princes. Yes, she rips the beating hearts from their chests and then buries them on sand. She’s the perfect anti-heroine. Vicious and cunning, struggling with the humanity she has found in a human body. And, yes, Lira is changed into a human after she disobeys the Sea Queen, who happens to be her mother. Nevertheless, Elian is her match. A pirate prince that doesn’t want to be king and a siren killer who wants to keep the seas and his kingdom safe even if it means giving up his freedom and live the rest of his days miserable. All for the greater good. What is not to love about Elian? These two were a match made in heaven... or in hell, it really depends on the perspective. They are always with something up their sleeves, always outsmarting each other. The romance between these two flows naturally - a hate-to-we-do-not-trust-each-other-to-we-are-alike-to-love relationship (hate-to-love relationships of my favourite tropes ever) – and it doesn’t overshadow the main plot. I’d also like to mention Elian’s crew. Torik, Kye and Madrid were all kinds of awesomeness. I enjoyed the friendship between Elian and Kye so much. Kye would always be there to protect his back. I was especially fond of Madrid, the only woman in the Saad. Her background story just stole my heart pun intended. World building: This is a ruthless and poetic, twisted and bloody tale of The Little Mermaid with unique spins and twists. With all its myths (there’s even a mention to Midas) and folk tales (there are sirens, mermaids and even mermen which are even crueler than sirens), the world woven by Christo is alluring. The settings are simply gorgeous. One hundred and kingdoms to meet, each one of them with their peculiarities, and the secret sea of Diávolos where the siren kingdom of Keto ruled by the Sea Queen with an iron fist can be found. Everything is magical! Thank you to NetGalley and the publisher for providing me with a review copy in exchange for an honest review. One of my favourite books of the year without a doubt. I loved how amazingly written Lira and Elian were were as individuals as well as together (such a perfect match). I am glad you were able to love this one so much! I have seen this one in a lot of book haul posts but I think this is the first review I am reading of it. I love when the writing style and pacing is done so perfectly and you just want to keep on reading forever <3 The duality of their relationship and how it is perfect but can see as a bad match at the same time intrigues me! My expectations were high, so I'm glad To Kill a Kingdom lived up to them. The duality of Lira and Elian relationship is one of the novel's highlights for me. This sounds so great. I'm very curious about it since I saw it on NG (but just wish only for me unfortunately) so it is great to hear such good things. It receive this ARC cop from Netgalley UK. There it was available for reviewers who don't live in USA. So glad that you enjoyed this one! I will probably pick this one up soon and I'm glad that it meets all the hype the synopsis promises. Thank. It's difficult not to request books on NG. I know I can't resist (I already have too many to read). I have seen folks say so many good things about this one so I'm glad to see you enjoyed it. I've read a sampler and from that alone I could tell this was going to be good. Now I just need to take my copy off of the shelf because this sounds brilliant. I hope you adore To Kill a Kingdom as much as I did when you have a chance to read it. This is a brilliant book indeed.